Guest Blog Post from our friends over at ClassroomFreebiesToo.com! Hope you enjoy. This post is for all my teacher blogger friends out there. 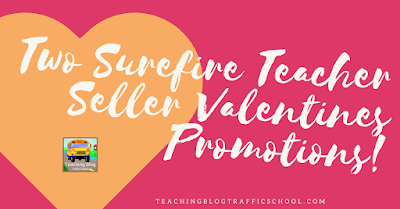 I have two (spoiler alert: there's actually more than 2 shared in the post) ideas for promotions to run for your teacher seller business for Valentines Day! Stop by Teaching Blog Traffic School to read the solutions and grab a free planning sheet while you're there too!